Lets hope the product that many love will be back in some form. (Update: Twitter has launched a weekly email digest.) Until then, there are some viable alternatives. I have been using all of these side by side with Summify for some time now and most provide content on a similar level. Using two or more of these services below will fill your news aggregation needs. Percolate - Gathers data from Google Reader, Twitter, and Tumblr. You have the option of getting the summary emails in the morning, morning and afternoon, or none at all. It "bubbles up" the most interesting and shared content of interest to you. The emails are organized nicely and are most similar to Summify's in how it shows who shared it and provides a snippet of the story. 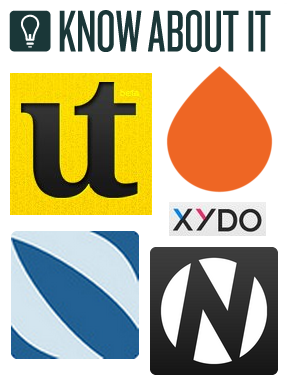 NewsWhip - Tracks the stories published by thousands of news sources then analyzes their social activity. By calculating the speed and scope of their social spread they are able to determine the most engaging and popular news. The number of shares, likes, Tweets, comments, and Facebook activity are used in their algorithm. In addition to viewing their website you can signup for NewsWhip Daily to receive a summary email of the top stories in topics of your choice. The email that comes every three hours can be enhanced by linking your Facebook account to see the news your friends are sharing. News.me - Sends a daily digest email containing items from your Twitter stream as well as top stories in their network. The email is a nice daily snapshot of top items around, but it is not good at determining relevance to you. This can be a good thing when combined with a more relevance directed service so that you don't miss out on the outside world. XYDO - (Update: now called Curate.Me.) Provides a daily brief by email that is based on the most interesting people you follow and experts that share your interests. To personalize the email you can follow different communities (interests) in which people post content to in addition to the automated curation feeds. Those are combined with, and prioritized further, based upon your Facebook, Twitter, Google Reader, and LinkedIn data. Know About It - As noted in our previous post it sends a daily email after crunching your Twitter, Facebook, and Tumblr streams to determine what interests you. It also can use your RSS feeds (including Google Reader's), Twitter Lists, and people you follow on Disqus. I find the email does a good job of collecting the day's posts, but the item titles tend to be nondescript. It is worth a look especially with its Read it Later and Instapaper integration. Utopic - This once a day email is a little sparse for me, but suspect if I actively used the service's website more it would be more robust. As it stands it scans my YouTube, Twitter, Facebook, and Google Reader accounts for relevant stories I may have missed. Connecting to and follow other users furthers the curation. Scoopinion - An email is sent bi-weekly with stories based upon your website article reading history; not your social networks. This is a new service that I have only been using for a week, but I have found to be very good. It works by using a Chrome browser extension to collect your reading data on reviewed and approved news sites (list). It categorizes the articles, then based on what you have read, and where you spent the most time, it tailors the email to provide you with the most interesting stories. Have you used these services, and if so, what do you think? Are there other ones that you have been using that curate well? Share your comments below. Thanks Coleman! I have actually had a Trapit account since November. It is interesting and discovers good content, but it is more labor intensive to setup than other services. It would be nice if I didn't have to create a trap for each subject. Simply linking my Twitter and Facebook account should provide enough information/data to get things going. I can definitely see how that could help. I just started working at Trapit, so I really am not yet sure what their thinking is on that. Hey, this Trapit sounds good to me... I have to customize & heavily filter everything. I'm looking for a service like the content recommenders reviewed above to use on *my* content-driven website. Something I could install on a Drupal site which would monitor user and site-wide activity and generate digests of recommended content for the users. Do you know of a service or API that can provide that feature for a single site?